Between 1868 and 1988, approximately 4000 medical books were imported from Japan to China. Many of these were Chinese medicine texts which were re-imported to China from other countries because the original books were held outside of China, and close to 1000 of these medical books originated from Japan. 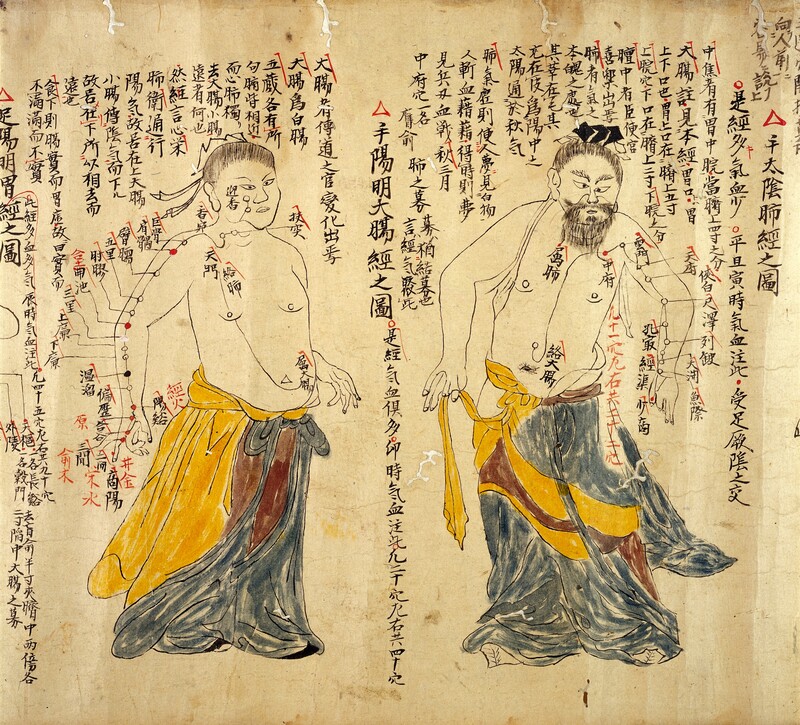 The first laws governing medicine in Japan were established in 701, and are referred to as Ishitsu-rei.¹ Ishitsu-rei regulated and defined the medical practice of acupuncture and moxibustion. “The laws stated that not only the acupuncture student, but also the medical student had an obligation to study acupoints, inferring that acupuncture was regarded as important medicine.”² During the next 1200 years, acupuncture continued to be a very significant part of the public health system in Japan. The exchange of knowledge between Japan and China was active and influential. People who studied in China developed new styles and techniques of acupuncture treatment and organized their own private schools in Japan. Unfortunately, in 1635 the government of Japan decided to close off the country and entered into “a period of isolation.” This isolation lasted 200 years and heavily influenced the direction of acupuncture. For example, moxibustion (burning mugwort herb to an acupoint) became popular as a treatment that ordinary people could practice by themselves. Also, during this time, Holland was the only country allowed to continue to trade with Japan, thus Holland’s Western medicine had a strong influence on Japanese medicine. Finally, in 1868, the government of Japan ended any support for Japanese (Chinese) traditional medicine, and Western medicine became the main medical practice ending a 1200 year span in which acupuncturists were equivalent to doctors.³ However, despite these tremendous obstacles, Japanese acupuncture survived and has flourished up to our present day. Today, in modern Japan, Kampo medicine (Japanese traditional medicine based on Chinese traditional medicine) has been fully legitimized and has been widely integrated into the Japanese health care system. Currently, 148 different formulations are recognized by the Ministry of Health and the Ministry of Labor and Welfare, and can be prescribed within the national health insurance system.⁵ An article on Kampo medicine published in the August 21, 1993 issue of the medical journal, The Lancet, reported that 70% of the 200,000 physicians in Japan regularly prescribe Kampo herbal drugs to their patients. Of those types of physicians who regularly prescribe Kampo medicine and treatments, high percentages are found among gynecologists, with 88% prescribing Kampo medicines or techniques, followed by urologists (83%) and cardiologists (83%). A survey conducted by Nikkei Medical indicated some of the main reasons why there has been an increase in the number of physicians prescribing Kampo medicine. This survey found that 65% of those physicians who had prescribed Kampo medicine believed that Western medicine has inherent limits that could be compensated for by these forms of treatment. Japanese acupuncture puts a lot of emphasis on the use of abdominal palpation to judge the insertion point of the needle. This practice comes from the many blind acupuncturists of Ancient Japan. Now a standard in the acupuncture field in the U.S., guiding tubes for needles were not part of the Ancient Chinese traditions. They were developed in Japan in the 1970’s. Chinese acupuncture tends to manipulate the needle when inserted into the body much more than Japanese acupuncture. Japanese needles tend to be a smaller gauge, while also typically being sharper than Chinese needles. Many say that this is the reason for a gentler, more superficial needling with less pain on the patient. Japanese needling is extremely gentle and superficial (meaning only focused on the surface and maybe slightly under the surface of the skin). Some Japanese needling techniques include a use of contact needles designed for a specific use that do not penetrate the skin at all. For example, there is a known pediatric method called Shonishin. Chinese needling fosters more depth of insertion. For some patients this may feel to be too painful, while for others this feels as a stronger Qi sensation through the body. Chinese acupuncture gives patients a much more distinct feeling of qi moving through specific points in their body. Japanese acupuncturists almost always incorporate moxibustion into their treatment. This involves burning cones of moxa (derived from mugwort plant) over the patient’s skin before needling. This warming sensation adds to the soothing nature of Japanese acupuncture. Chinese acupuncturists also may use moxibustion but most frequently in a form of a mugwort charcoal stick that is held above the acupoint until the warming sensation arrives. 1 Goto, S. What Is Japanese Acupuncture? The Japan Society of Acupuncture and Moxibustion. 5 Watanabe, K. et.al. (2011 Feb). Traditional Japanese Kampo Medicine: Clinical Research between Modernity and Traditional Medicine – The State of Research and Methodological Suggestions for the Future. Evidence-Based Complementary and Alternative Medicine, 2011: 513842. Retrieved from https://www.ncbi.nlm.nih.gov/pmc/articles/PMC3114407/. 6 Oura, J. Translated by Takahashi, H. The Characteristics and Essence of Japanese Acupuncture. North American Journal of Oriental Medicine, 14(41), pp. 3-6. Retrieved from http://www.najom.org/the-characteristics-and-essence-of-japanese-acupuncture.html.